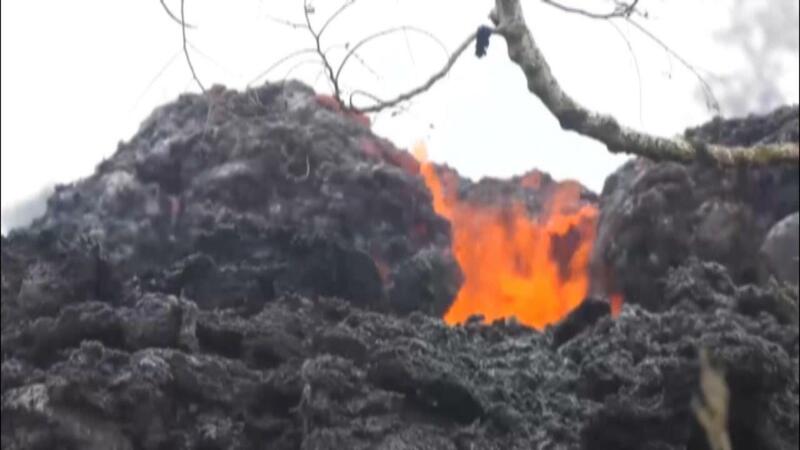 Officials say fissures near Kilauea volcano are releasing high levels of sulfur dioxide; Jeff Paul reports from Hawaii. PAHALA, Hawaii – Hawaii residents are facing the highest volcanic activity alert after officials warned Tuesday that the Big Island&apos;s Kilauea volcano is growing more explosive -- as a massive ash cloud grows in the sky. The U.S. Geological Survery upgraded its previous volcano warning from "orange" to "red," signifying that an "eruption is forecasted to be imminent with significant emission of ash into the atmosphere likely," or that an eruption is already underway. HAWAII VOLCANO: WHAT&apos;S THE WORST-CASE SCENARIO FOR KILAUEU? “At any time, activity may become more explosive, increasing the intensity of ash production and producing ballistic projectiles near the vent," local officials told Fox News amid the alert, which was issued just before 1:30 p.m. local time. Volcanic air pollution and ashfall have been reported in Pahala, and National Weather Service radar and pilots have reported the top of the volcano&apos;s ash cloud is 10,000 to 12,000 feet above sea level. Fox News&apos; James Rogers and The Associated Press contributed to this report.